Now that you are ready to start the plumbing work, you have noticed you need to improve in certain areas. Plumbing is relatively easy if you know what you are doing and if you follow building code regulations. Most jurisdictions follow Uniform Plumbing Code requirements for pipe sizes, but each jurisdiction may have additions or deletions to the code or only use a specific year of the code. This article presents some of the most common mistakes plumbing contractors faced when doing their work. It is easily overlooked that basement fixtures need to have an appropriate vent. Sometimes it is easy to combine vents, but you might want to check your local or state building code. Also, it is also important to add a vent to very trap. When there is no trap, water can be siphoned out, leaving the trap dry and useless. Do not use an S-trap for the sink drain; a P-trap is the right one for this application. Too much slope is never good. If you think that having a higher slope will make things easier, think again. A high slope means that liquids will move faster than solid, leaving solid behinds causing major issues later during normal operations. Ideally, 1/4 inch per feet should be enough. Although some fixture could have a combined vent, building codes regulate the amount of fixtures added to a common vent. The most common error is when more than 24 fixture units are combined on a 2-inch vent pipe. There are many times that the cleanouts are located just in the wrong location. It is important to have the required clearance in order to service the line when it gets clogged. Clean outs are not required by the code above the first floor but you might want to consider depending on how the line was designed to add some clean out just to facilitate servicing the line. Clean outs are required at the base of each sanitary stack, on horizontal branches that are 100 feet apart, when the change of direction of the line exceeds 45 degrees or within 10 feet of connection between the main drain and the sewer. Be sure to have enough clearance to move around. The toilet must be at least 15 inches from the side wall and at least 18 inches from the wall in front of the equipment. Lavatories must also be located at least 18 inches from the front wall. Water heaters are equipped with pressure and temperature relief valves that will release pressure when there is a continuous rise in temperature and pressure. The drain line must be a full-size pipe, slope to drain without valves between the drain and the outlet. The fitting located at the end of the line, must not contain any thread and distance from the floor drain shall be carefully observed. This one is very repetitive and can lead to serious problems. 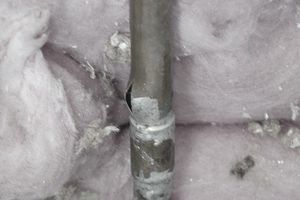 A galvanized metal pipe cannot be connected to a copper pipe, as these materials will interact with each other, and will corrode very quickly. You might want to use some sort of brass of another type of fitting suitable to connect these lines.